in rooms I rarely visit. There are more than six billion results. 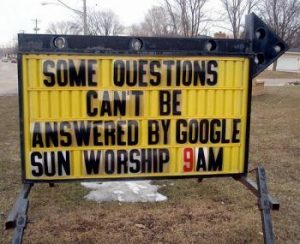 What a creative idea it was to use photos of church message boards as poem names. This poem explores disappointment and disillusionment and then ends on an ironic note about using a computer to search for the meaning of life—a conclusion that perfectly matches its title.